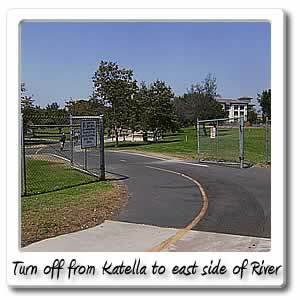 Welcome to Katella Avenue on the Santa Ana River bicycle trail. At 13.3 miles and 1 hour and 7 minutes from the beach, you'll be at Katella Avenue which has alot to offer as far as many points of interest, food and drink and other services. 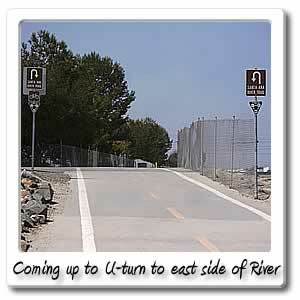 Getting off of the Santa Ana River Trail here, will take you to the most points of interests that any entry/exit points have to offer on the Santa Ana River Trail. You will find the Honda Center, Angel Stadium, Grove of Anaheim, Disneyland, and Anaheim Convention Center. The newly constructed ARTIC is also in the same vicinity. 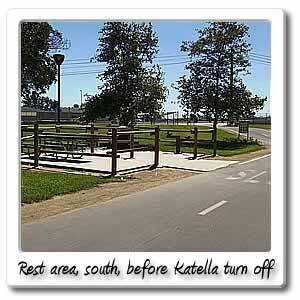 If you are going north on the Santa Ana River Trail, go under the Katella Avenue bridge, then go left and then go out to Katella Avenue going west and a couple hundred feet, you'll find the entrance to the Honda Center, which is located at 2695 East Katella Avenue in the City of Anaheim, which currently owns the Honda Center, that opened in 1993. Most of time the Honda Center, is referred to as "The Pond". Until 2021 Honda has purchased naming rights to the indoor arena, with room for over 17,000 fans. Across the street from the Honda Center , is ARTIC and then behind that, Angel Stadium but you'll have to go south on Douglas Road for .3 miles and 2 minutes, passing by the ARTIC to reach the parking lot and then you can wind around the entire parking lot to get around Angel Stadium. Just after going southwest on Douglass Road, you'll be at the northeast entrance, but if you're on bike or walking, you can just completely bypass the shacks for paying for parking and save the $10 for parking. Very close by there is the Metrolink Station and Amtrak station from these stations, you can go south to Oceanside, or east to Riverside or San Bernardino, or west to LA, or even out to Lancaster and Palmdale, or go south west to Ventura County. Right around by the Metrolink and Amtrak is the future planned ARTIC station. Once built the Anaheim Regional Transportation Intermodal Center ARTIC is going to relocated the two trains, and add in tracks, and electrical lines, for the planned California High-Speed Rail and Rapid Transit Line to the Anaheim Resort District and Disneyland. We've been taking pictures of the construction the whole time at the new ARTIC which is also going to include 14 bus bays, so you will be able to transfer to just about any transportation choice there. Getting back to Angel Stadium, located at 2000 East Gene Autry Way, in the City of Anaheim, was built in 1966, and is also owned by the City of Anaheim, just as the Honda Center is. As of 2012 there's seating for almost 50,000 fans and 78 luxury suites. At the time of building, the stadium was built on 160 acres. The All Star game was hosted at the stadium in 1967 and then again in 2010. Views of the Brea hills, the 57 freeway, and San Gabriel and Santa Ana Mountains, can be seen past the Outfield. The stadium is also referred to as "The big A". There is also a landmark "Big A" sign that's 210 tons, in the eastern part of the parking lot with a halo at the top 230 feet high. The top halo is lit up whenever the Angels win on the road or at home. 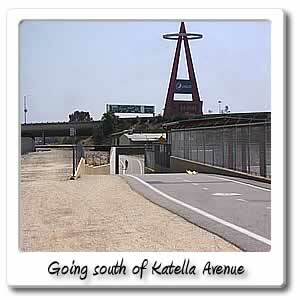 The main entrance gate to Angels Stadium of Anaheim which is off of Gene Autry Way and State College Boulevard. There is also an entrance to Angel Stadium off of Orangewood Avenue, very close to the Santa Ana River Trail, if you exit the Orangewood Avenue bridge, and go west. 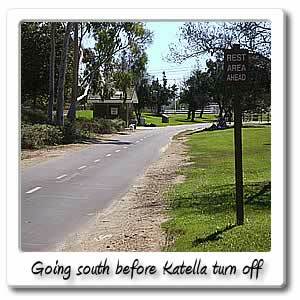 Going west on Katella Avenue for 2.3 miles and 13 minutes from the Katella Avenue exit/entry point, you'll reach Disneyland and the Anaheim Convention Center, at Harbor Boulevard. 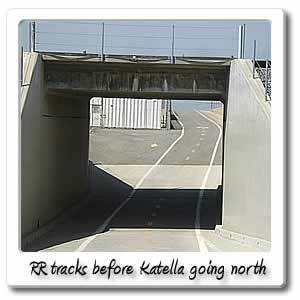 There is more information on both of these two other points of interest off of Katella Avenue, in the City of Anaheim, by checking out the Anaheim Convention Center, and Disneyland pages. 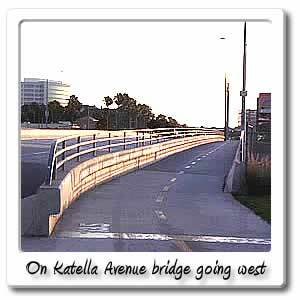 If you continue west on Katella Avenue, after 12 miles and a little over and hour later or more depending on the traffic you'll hit the Coyote Creek Bikeway in the City of Long Beach. 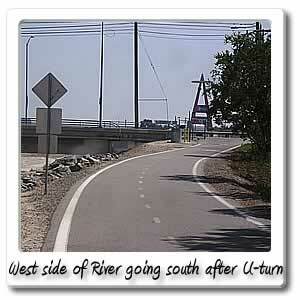 I f you continue going west for .4 miles and 2 minutes, you'll hit the 28 mile San Gabriel River Bike Trail, which is also in the City of Long Beach, in Los Angeles County. 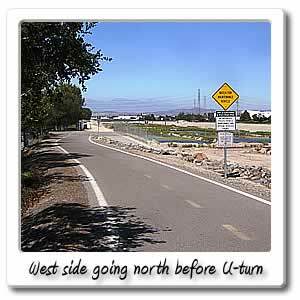 If you go west another 6.8 miles and 40 minutes later that will take you to the 28 mile Los Angeles River Bike Trail, that's in Long Beach. 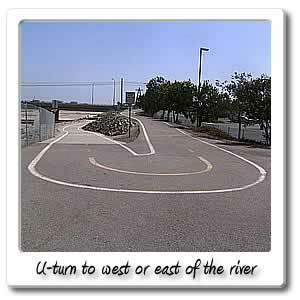 By going north on this bike trail, you can get to Downtown Los Angeles. 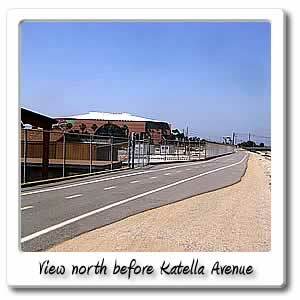 With all the excitement going west on Katella Avenue, I'm sure you're wondering what's in store, if you go east. 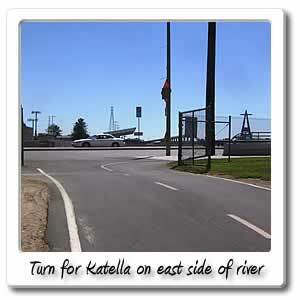 Before the Katella Avenue bridge, start heading to the right, and get right off the bridge at Katella Avenue and go right. You will be going east on Katella Avenue, in the City of Orange, if you go for 2 minutes and .4 miles east and turn into the Stadium Theater parking lot you will find an Acapulco Restaurant, Fish place, cafe and bar, Chili's Restaurant, Subway and of course the 25 screen Century Stadium Theatre, just before you reach Main Street in the City of Orange. 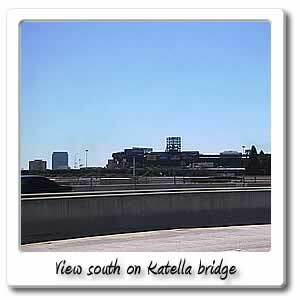 Across the street, is Katella Grill. At a little more than 1 mile or so, you'll find a Jack in the Box, in the same parking lot as Home Depot, right before the railroad tracks, and Glassell Street, in the City of Orange, not too far from there. As far as food and drink going west on Katella, around by the Honda Center, Angel Stadium of Anaheim, Disneyland and the Anaheim Convention Center, you will find alot of choices off of Katella Avenue, as you go through the City of Anaheim, and then even more choices as you go south and north on the major streets off of Katella Avenue. 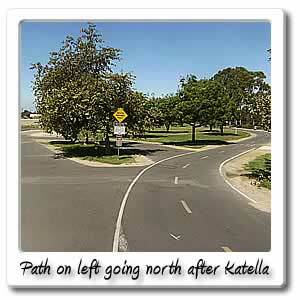 We are only going to mention the food and drink choices on Katella Avenue itself. First 500 feet west off of the Katella Avenue entry/exit point at Douglass Road, you'll find JT Schmid's Restaurant and Brewery and not too much else at the small strip of businesses, but there's hope by the end of the year, there are several retail and food units that should be opening up in the newly constructed ARTIC.This is all about 35 seconds after you get off of the Santa Ana River Trail. 3 minutes after you get off the Santa Ana River Trail, and just right after going under the 57 freeway underpass on the other side of the street, you will find Hooters, Comerica Bank, Rubio's Mexican Grill and Zito's Pizza at Howell Avenue, just .5 miles from the Santa Ana River Trail. You will have to go .2 miles and for another minute just right after coming back up from going under the train tracks for the Metrolink and Amtrak, that are located in the Parking Lot of the Angels Stadium of Anaheim. At .7 miles and 4 minutes off of the Santa Ana River Trail, you can take a left on Sportstown for City National Grove of Anaheim and for the North entrance of Angel Stadium. More importantly making a right into the shopping center you can find a Starbucks, Panda Express, Carl's Jr., Denny's and a Community Bank. The Catch Restaurant is across the street from the center. By the time you get to the end of the shopping center, you'll be at St. College Boulevard, and there will be a Mc Donald's across the street, surrounded by the 1818 Platinum Triangle five story work lofts. There's an AM/PM mini market across from there, then there's a Kelly's Coffee and Fudge and Juice it Up, on the bottom of five story Stadium lofts. This area is referred to as the Platinum Triangle District, which also includes the National Grove of Anaheim, Angel Stadium of Anaheim, and the Honda Center. Most of the industrial buildings are relocating to make way for 50,000 people to move into over 18,000 new housing units, with alot of loft environment office then housing space above in the 16 planned mid rise apartments. There will be all kinds of commercial and office space in high rises, that has been planned for the fastest growing area of Orange County, just before the recession in 2009.